The cool and compact Toyota Aygo Hatchback is boldly designed, sports cheap-to-run engines, and is tailor made for the commute to work. If you need a new partner in crime for the city, you’ve got a lot of options. 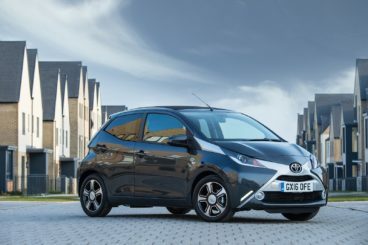 The Aygo puts itself forward as the affordable but stylish option that comes with either three or five doors, handles superbly in tight situations and doesn’t look quite as schmaltzy as some rivals. OSV takes a closer look at what it’s all about with our 2017 Toyota Aygo Hatchback review. Like all city cars, the Aygo feels right at home in the town. It’s small enough to manoeuvre those tight turns that leave saloon drivers trailing, and doesn’t give you any grief when it’s time to park. It just slots right into the parking spot with ease. Combine that with excellent visibility and it’s clear that the Aygo is perfect if you’ll be spending most of your time in congested cities. Naturally, however, there is more to consider. If comfort is a must for you, the Aygo doesn’t have the most consistent ride quality. Over poorer surfaces, it will jerk. That said, it never becomes too uncomfortable. At speed, body lean will be an issue in corners, while a pair of transmissions are available. We like the 5-speed manual; it’s just as competent as the automatic and is cheaper to run. The automatic transmission is a smooth mover, and we wouldn’t overlook it. But it will have a negative impact on economy, and it’s not available with the entry level model. In terms of the engines, there is only one available, a 1.0-litre petrol unit. It’s also featured in the Citroen C1 and the Peugeot 108, but at least those cars have more powerful options, too. As such, the Aygo lacks the oomph of some rivals. Pair the engine up with the automatic transmission, and it takes a leisurely 15.5 seconds to get from rest to 62mph. The manual fares better, and covers the same 0-62 dash in 14.2 seconds. The good news is that working the engine isn’t taxing at all, as its 68bhp is enough for city conditions where it never feels overwhelmed. Even on the motorway it feels competent. Sure, there isn’t much power, but overtaking is easier than you might think. As a bonus, it’s also a fairly quiet engine. As we just mentioned, the engine is fairly quiet. It does emit a consistent thrum, but it suits the car’s character and doesn’t become annoying. Moreover, lots of sound deadening has helped to reduce it to little more than background noise. And when you do accelerate hard, it even sounds quite sporty. Insulation overall is good, and road and wind noise is well suppressed. 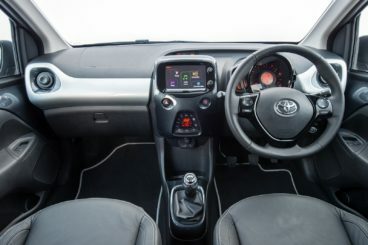 The fit and finish of the cabin is fine, with the Aygo now a pleasant place to spend your time on the road. We like the gloss-black finish on the dashboard, while the speedometer is a stylish touch. The controls and buttons are for the most part easy to operate, but there is evidence of cheaper plastics here and there. The steering wheel lacks adjustment too, which might irritate some drivers. In terms of how practical the car is, the best way to sum it up is “adequate.” Its dimensions are undeniably compact, but this ensures that it’s easy to park. Visibility is also good, while the inclusion of a double bubble roof means that headroom is more than decent for all. Rear legroom is more of an issue – even smaller adults will struggle to get comfy. The windows are small too, which can create a feeling of claustrophobia. The glovebox is reasonably sized, while the car is available as either a three or five-door. The latter makes it much easier to access the rear of course, but it costs £400 extra. The boot, meanwhile, is a bit of a disappointment and measures just 168-litres. It’s a bit inaccessible and there is no chance of a flat floor. Although there is only one engine, there are a number of trims to choose from. The entry level x trim will be too basic for most, but its dirt cheap price tag will be attractive. Its standard kit includes LED daytime running lights, hill-start assistance and a USB port. The x-play model adds more customisation options, manual air conditioning, heated door mirrors, a digital radio, Bluetooth, and a multi-function height-adjustable steering wheel. Move up to the x-press model and you benefit from a 7” touchscreen infotainment system, a reversing camera, automatic air conditioning, automatic headlights, 15” alloys and red exterior trim. Rounding off the range is the x-clusiv trim (smooth name), which gets keyless entry, a reversing camera, climate control, leather upholstery – but sat nav is still optional. Is the Toyota Aygo Hatchback safe? There’s always a worry with smaller cars that they’ll be too slight to keep us secure on the road. The Aygo scored 4/5 when crash tested by Euro NCAP, while its standard safety kit includes tyre pressure monitoring, ISOFIX child-seat mounts, electronic stability control and antilock brakes. Prices for the new car start out from £9,255 and rise to £14,895. If you prefer to lease, you can pick up a deal from £114 + VAT per month. For more information on our leasing deals, check out our page here. In terms of its running costs, the car’s 1.0-litre engine has been carried over from its predecessor, but it now costs a bit less to run. It can return 68.9mpg at best, and emits just 95g/km of CO2. This is if you pair it up with the manual gearbox. Opt for the automatic and those numbers fall, but only slightly. All models cost £140 a year to tax in year one and £180 in the years after that, while the car sits in insurance groups 6 and 7. There is only one available, but if you stick to the manual version, you’ll find it’s sprightly in the city. Few city cars are as assertive-looking as the Aygo, and it can be customised to give it a personal touch, too. It comes out to play in the town, where its peppy engine, compact nature and keen sense of fun are very rewarding. Its driving dynamics are better than last time, but it’s still not as up to scratch as rivals on the motorway. It’s very much a budget car, which means you’ll need to be okay with hard plastics. Let’s see how the car fares against its rivals in the comparison section of our 2017 Toyota Aygo Hatchback review. The new Citroen C1 Hatchback is trendy, has lots of room for personalisation, and comes with the option of a full-length fabric roof. In a move that will frustrate some buyers, Citroen have decided to keep the same underpinning’s as last time. This means there is still too much body roll, and the car isn’t massively fun to drive. Still, its soft suspension setup means it’s comfortable, while the light steering ensures that it’s easy to drive in the towns and cities. With no diesels available, your choice is between two petrol engines. The smallest is a 1.0-litre unit that’s a typically noisy fare for a three-cylinder unit, but it’s a pleasant noise. It can get you from rest to 62mph in 13.0 seconds, but runs out of puff on the motorway. The 1.2-litre petrol engine might be more expensive, but it’s our top pick. It tops up its power by 13bhp, which is enough to help it keep up on the motorway. 0-62 is dispensed within 10.9 seconds, and it has a good turn of pace. Despite there being an absence of diesel engines, running costs are good. The smallest petrol engine returns 68.8mpg economy, while both emit less than 100g/km of CO2. The bigger of the two petrols is good for 65.7mpg, which makes it easy to recommend. Insurance is affordable too, with the bigger of the two petrol engines sitting in group 10 out of 50. Inside, the Citroen C1 Hatchback isn’t quite on the level as the Aygo. Quality is questionable, and there are plenty of cheap plastics here and there. Getting comfortable in the basic model won’t be easy, as there is no height adjustment for the seat, but the suspension does a good job of keeping you otherwise comfy. The dashboard looks good, its funky design and bright colours appealing to younger drivers. There is plenty of scope for personalisation, too. 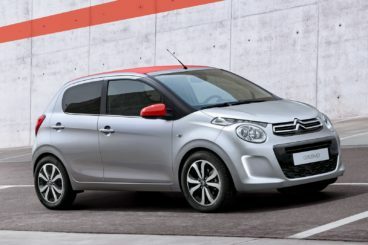 Is the Citroen C1 Hatchback practical? Not massively. The rear seats are cramped, while the 196-litre boot is one of the smallest around. That said, it’s bigger than the Aygo – but that doesn’t say too much for either of them. Still, it is bigger than last time and comes with a wide opening. The new Peugeot 108 Hatchback is cheap, cheerful and comes with the option of a full-length folding roof. The new 108 replaces the dated 107 and feels like a big improvement. The ride quality is much better, and the steering is lighter. The two petrol engines on offer are perfectly fine in the city, but taking them out onto the motorway might be a nervy experience. That said, if you stick to urban sprawls, the entry level 1.0-litre petrol engine will be just the ticket. On the other hand, if you’re expecting to venture outside the safety of the cities and towns on a regular basis, stepping up to the more powerful 1.2-litre engine is worth it. It might cost more, but its extra punch sees it cover the 0-62 dash in 11.0 seconds, while the smaller engine does it in 14.3 seconds. Indeed, the Peugeot 108 1.2-litre is faster than most of its rivals. Neither engine is bursting with power, however, and as such running costs are good. The 1.0-litre unit is the most frugal, and can return almost 69mpg while emitting 95g/km of CO2. The 1.2-litre engine, meanwhile, is good for 65.7mpg. Both models cost £140 a year in road tax. Inside, the Peugeot 108 Hatchback looks and feels a lot better than its 107 predecessor. It feels mature, something that’s helped by the improved ride quality and insulation. It’s nowhere near as noisy as last time. The dashboard has been cleaned up, and each model barring the entry level trim comes with an easy-to-use 7” touchscreen. 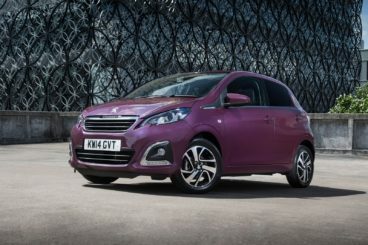 Is the Peugeot 108 Hatchback practical? There is a three door and a five door model available, and we wholeheartedly recommend the latter if you’ll be travelling with a full load often. If you’re on a budget, don’t think you can pick up the three-door model for dirt cheap – the entry level model is only available with five doors. Its compact size makes it easy to drive, but back seat space is a bit cramped. Two adults will be fine on brief trips, but long ones will really test them. The boot, meanwhile, measures 196-litres, which is bigger than the Aygo by some margin. The new Aygo isn’t massively different to last time, but there are noticeable improvements. It’s cheaper to run, emits less CO2, is quieter inside, and looks bolder. However, a few of the old deficiencies remain. The interior is still marred by cheaper plastics, and it doesn’t hold up on the motorway. That aside, the new Toyota Aygo Hatchback is a compact, fun and affordable way to get out and about in the city.